Unleash the power of the scarab as you launch them at blocks to uncover the secrets of Pharaoh Akhenaten. Unleash the power of the scarab as you launch them at blocks to uncover the secrets of Pharaoh Akhenaten. 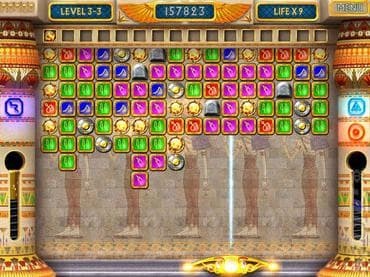 Shoot blocks to gather coins, gather coins to earn the Nine Mystic Gems, and use the Gems to solve the Pharaoh's Mystery. But you'll have to move swiftly. Let the blocks drop too far down and your journey will end and the Pharaoh's Mystery will remain unsolved. Download free full version game today and embark on an amazing journey! If you have questions about Pharaoh’s Mystery game, please contact us using this form.